In the past two years I have become increasingly fond of persicarias. I suppose it is not so much that I like them as admire them – for being generally good-natured, easy, reliable, long-flowering and attractive and with a sort of ‘man of the people’ charm. As a group they generally prefer moist soil, can deal with heavy, clay soils and do not suffer from any major pests and diseases. 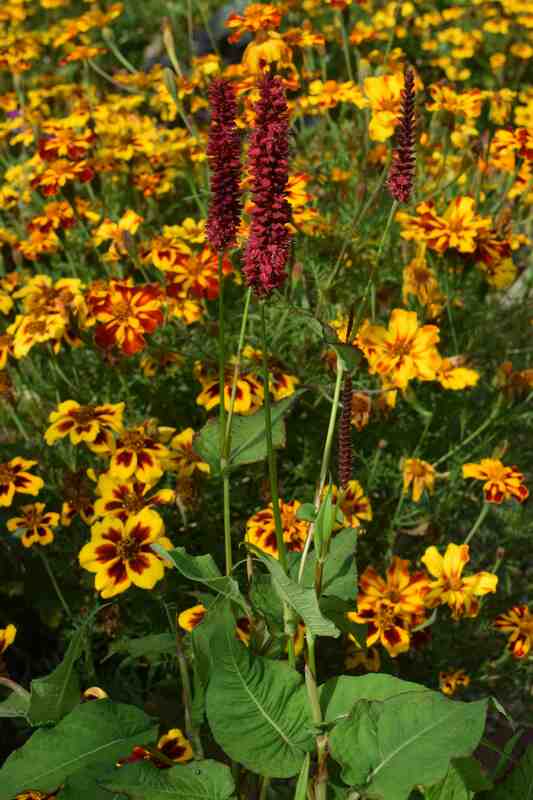 They are good for cutting too and their leaves are dull and weed-suppressing at worst and attractive at best. I think I could easily get into collecting them if I was not careful and when I was at Mount Usher the other week I was smitten by a particularly attractive cv in the small plant centre. 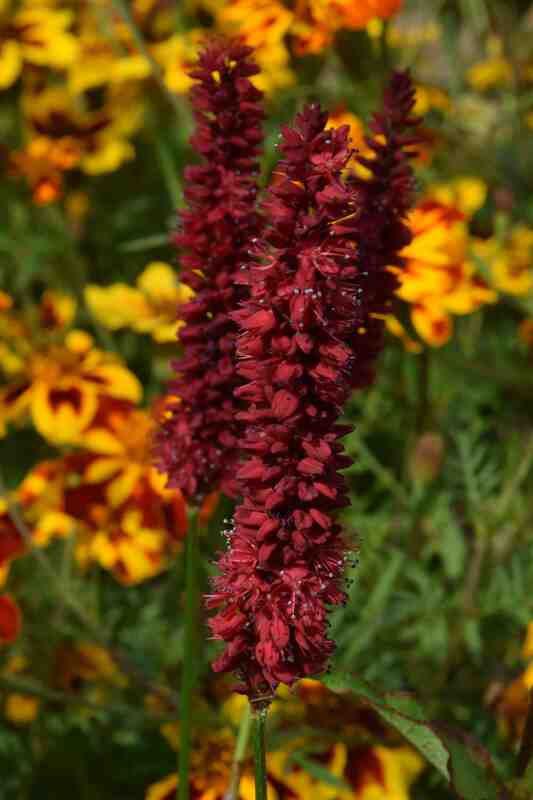 Called ‘Blackfield’ it caught my eye with its rich, deep red flowers and I couldn’t leave without it. 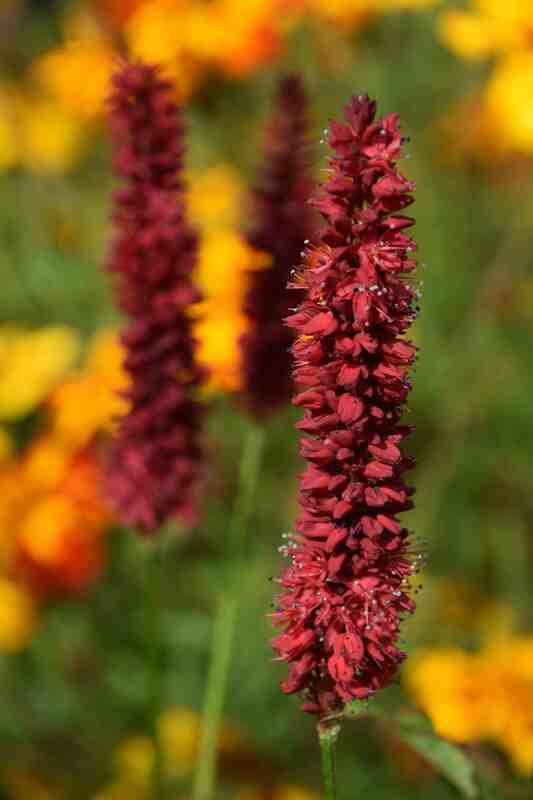 Persicaria amplexicaulis is a Himalayan species that forms clumps but is not invasive and grows to a maximum of 1.2m high and about as much across. The individual flowers are small but carried in dense spikes above the foliage and appear from mid summer to autumn. It is easy to divide the clumps, in autumn or spring to plant bigger drifts in sun or part shade – but not in dry shade under trees. Traditional cvs include ‘Arun Gem’ with drooping flower clusters and the white ‘Alba’ with rather slender spikes of bloom. ‘Blackfield’ is a recent introduction of Belgian origin raised by Chris Ghyselen who also raised ‘Fat Domino’ and ‘Amethyst’. I have yet to plant it – in fact I will wait till autumn and split it I think* – but I wherever I put the pot I like it and it looked good in front of the ‘Naughty Marietta’ marigolds. I am looking forward to seeing a lot more of it next year. * Unlicensed propagation is prohibited but propagation for your own use is allowed. I grow “Firetail”, with very similar flower spikes, but which has reddish tones to its leaves. I agree with you – a great plant! I love this plant, I grow it with Symphiotrichum ‘ Little Carlow’ and the dark colour picks up the centre of the flowers beautifully. OMG! I had no idea asters had gone! I now see they became Symphotrichum in 2002. What is the world coming to! I liked asters – could one ever love a symphotrichum? Even one as lovely as ‘Little Carlow’! Not only have asters gone, but they have split up. We now have to call Aster divaricatus, – Eurybia divaricata. I still love Little Carlow whatever it is called. I think I will have nightmares tonight about evil taxonomists! Just so those who have deer coming into their gardens know, they also love all the Persicarias & unfortunately constantantly graze on them. Do not plant in their way. I am envious of others success as they are largely a great genus of plants. Fortunately we don’t have deer here – yet! Thanks for the warning! I grew Firetail in my old garden in Glen Ellyn IL. It is not often seen here but is an excellent performer and just like you say, weed suppressing. I also left Little Carlow there too!